"Thank you... Couldn't have done it without you... Thanks so much... That was so helpful... Thanks... You're a Rockstar... Thank you for all you've done for me... I really appreciate what you've done... Thanks Mum! Sometimes... You need More than just Words! Send a surprise thank you gift today. We can deliver in Auckland stylish pamper packs, thank you gift baskets, bright happy bunches of flowers, Thank You Gift Packages. 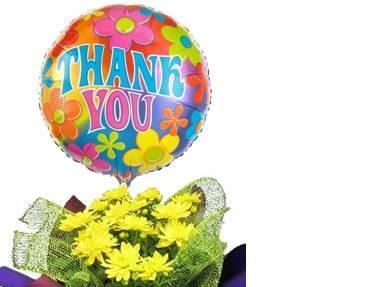 We also stock 'Thank You' Balloons - 'You're appreciated' balloons - cheerful pot plants or pretty spring posies. These all make a perfect gift to say thanks, and we can deliver your present for them to receive Today Beautifully Gift -Wrapped of course!